After arriving in Sterling, CO and grabbing lunch, I decided to head further north into the Nebraska Panhandle then west into Wyoming. 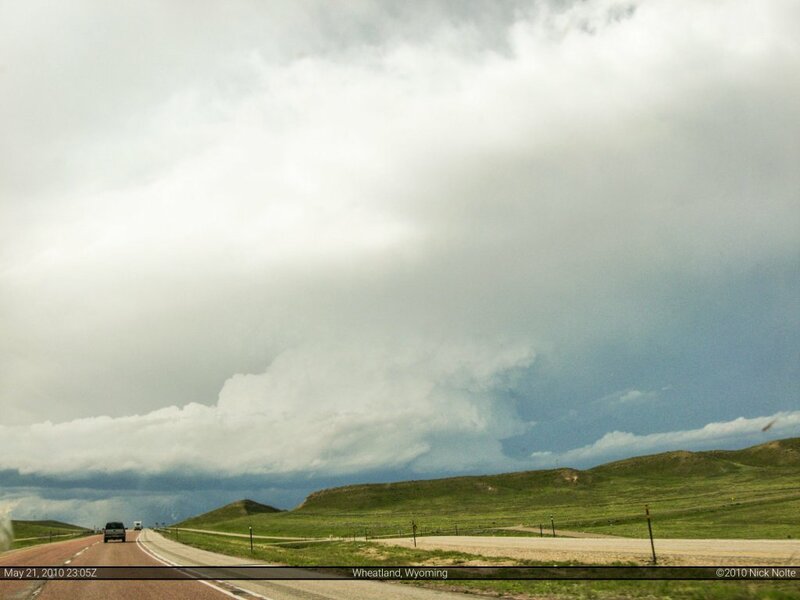 It wasn’t too long after arriving in Wyoming that a storm had started to go up west of Wheatland, WY. I hopped on I-25 in Cheyenne and headed north as fast as I could to try and get on the storm. As I drove up I-25 and eventually approached it, the updraft to the storm was simply amazing. Trying to get in position, though, was an exercise in futility as roads are hard to come by in eastern Wyoming. I ended up getting off I-25 at Wheatland and heading east on Wyoming 316. On my maps this appeared to be a state highway that would be well maintained through to Fort Laramie. No, no this wasn’t the case. The highway turned north onto a gravel road and then it eventually turned into a dirt road that looked like someone took a bulldozer through their fields, but it was signed and everything. Had that road been rained on prior to my traversing it, it would have surely been impassible for me in my Mazda 3. Luckily for me it was dry through to Fort Laramie where I was then able to get on US 26 and head southeast into Nebraska. The problem with this was the storm was moving mostly east, so the longer I stayed on US 26 the further south I became from the storm. I decided to stick it out until Highway 71 in Nebraska, then bolt north and try to get in position again. Took 71 all the way to Nebraska 2 where I saw some VORTEX crews launching a radiosonde. I turned north, but by this time the sun was beginning to set and the storm didn’t look that impressive off in the distance. After giving up on the storm I continued north to US 20 where I continued eastward through the Sand Hills of Nebraska to Valentine where I called it a day.